I’ve pretty much been a slacker on the blog due to schoolwork, trying to complete the adjustment to living in Den Haag, and to trying to develop social relationships, so I’m going to wrap up this backpacking trip. Paige and I spent the 24th through the 26th exploring Prague. What a beautiful city! Prague was not nearly as badly damaged in World War II as some of the other surrounding cities so most of the historical features of the city were preserved. Depending on where one is in the city, the architecture can be distinctly different from Renaissance, to Gothic, to modern – Prague really has quite a variety. Paige and I took the opportunity to rent a Segway (the motorized, stand-up scooters) and take a tour of the town. Once switched from “tourist” mode to “expert” (or whatever the next level was called), these things really moved! I believe our guide told us they got up to almost 20 MPH and their agility was actually quite impressive, as well. Our guide explained to us that students played quite a big role in the fall of communism in the former Czechoslovakia. He didn’t go into too much detail so this is per Wikipedia: ” On November 17, 1989, a peaceful student demonstration in Prague was severely beaten back by the riot police. That event sparked a set of popular demonstrations from November 19 to late December, and a general two-hour strike of the population on November 27. By November 20 the number of peaceful protesters assembled in Prague had swelled from 200,000 the day before to an estimated half-million…the Communist Party of Czechoslovakia announced on November 28 they would give up their monopoly on political power.” Cool story. Paige and I were able to see the four formerly indepedent citires that currently make up Prague’s historical center, including: the Old Town and Old Town Square (the original place of settlement in Prague in the 9th century), the New Town (founded in the 14th century), the Lesser Town (which was home to a number of noble palaces due to its proximity to Prague Castle), and the Jewish Quarter. We saw the Astronomical Clock, which hundreds of people gather around each hour to listen to the clock chime and to observe the four animated figures that emerge from the clock every hour, on the hour. Each figure represents something that is (or was) despised – Death (represented by a skeleton), Vanity (represented by a figure holding a mirror), Judaism (a figure holding a bag), and the Turkish (a figure with a turban). Again, this is per Wiki since the square was bustling when we observed this and our guide did not fully explain it. We also saw the Lennon Wall, the National Museum, the PetÅ™Ã­nskÃ¡ rozhledna (a 1:5 copy of the Eiffel Tower), the Å½iÅ¾kov Television Tower (though we didn’t go in it), the Dancing House (an interesting construction that is supposed to represent a man and woman dancing), and of course, the Prague Castle and Charles Bridge. One morning, we took a guided day trip to a town around 50-70 km outside of Prague called Kutna Hora. Kutna Hora was once the second most important city (behind Prague) in Bohemia due to the discovery of vast silver mines there in the 10th century. However, the city didn’t start rapidly growing until the publication of a legal document by the king outlined specifications of the operation of the mines. Once the silver mines were exhausted around the end of the 18th century, Kutna Hora ceased competing with Prague economically, politically, and culturally. It is a quaint, beautiful little city though and is home to the Saint James Church, the Saint Barbara Church, one of the more famous Gothic churches in Central Europe, and the real reason we elected to go to Kutna Hora, the Ossuary. During the Black Plague in the 14th century, many thousands of people were buried in the Cemetary of All Saints, causing it to be greatly enlarged. When a Gothic church was built on the site around 1400, the lower chapel of the church was used as an ossuary for the mass graves that were dug up during the construction. The bones were subsequently stacked in the chapel in the 1500s. In the late 19th century, the Schwarzenberg family commissioned a wood carver to artistically arrange the approximately 40,000 skeletons as decorations for the chapel. This was unlike anything I’ve ever seen in my life. Among the many bone decorations constructed by this wood carver, was the Schwarzenberg coat of arms and an enormous chandelier made of bones and skulls that greeted us upon descending the stairs into the lower chapel. Various other bone decorations hung from the ceiling and adorned the walls. The lower chapel was not very large, but it was extremely impressive and well worth the trip. By the end of the 26th, we were excited about flying back to Den Haag and finally having a place to call home for a few months rather than sleeping on people’s couches or in hostels. I can’t overstate though, how incredible of an experience backpacking all around Europe was. It enabled me to experience different people, different cultures, different foods (some good – the Italian food, some not so good – the “traditional Czech meal” I tried in Kutna Hora that was basically uncooked meat and cucumbers drowned in vinegar), see and do things I never would’ve dreamed I’d have the opportunity to do, and forge close friendships with our hosts and with my traveling companion. When we returned to the hostel on the night of the 26th, I was a little depressed that the backpacking was over until I realized that I’d only been in Europe for three and a half weeks and that the adventure was really just beginning. 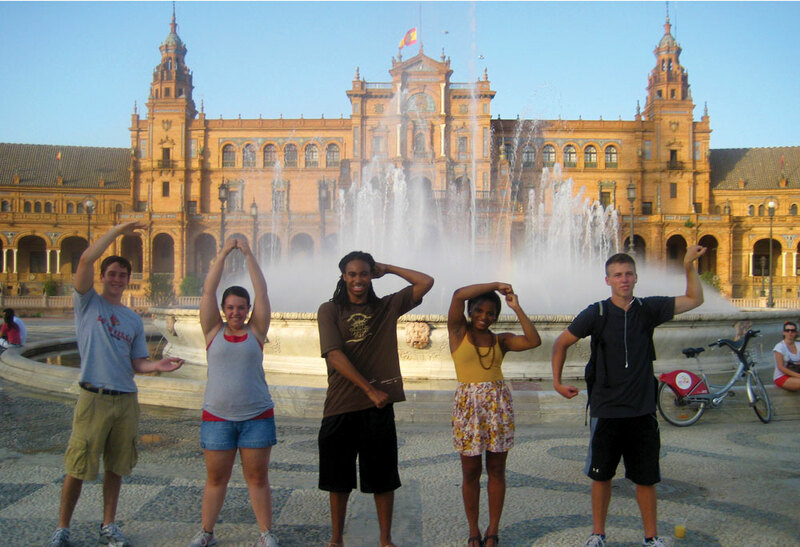 This entry was posted in Study Abroad by afarley01. Bookmark the permalink.